follow me home: Can men have it all? LOL, where in the world did you find that? Blue floral paisley bell bottoms. I think I have to have a pair made up for my husband. Then any time he's in trouble I won't have to say a word, I'll just lay them out on the bed. . .
OMG I am JEALOUS! I want some fancy clothes like that!!! Wow! Just Wow! It's actually not so very easy to make men's pants, either, so that's another wow! I know! Look at the princess seams on the shirts. That is some technical sewing, right there. :) I think I could actually make view A's pants for me in grey wool. Thoughts?? Dawn here from Spatulas On Parade. Karen at Baking in a Tornado is a good friend. she suggested your page. LOVE the pattern! I think my dh would NOT be happy if I made him those but the look on his face when he opened the gift would be priceless. Well hello, Dawn from Spatulas on Parade! I'm so glad to have you visit. (Karen keeps me going.) My husband wouldn't be happy either. I'll save it for next Father's Day! The patterns ARE for dad. 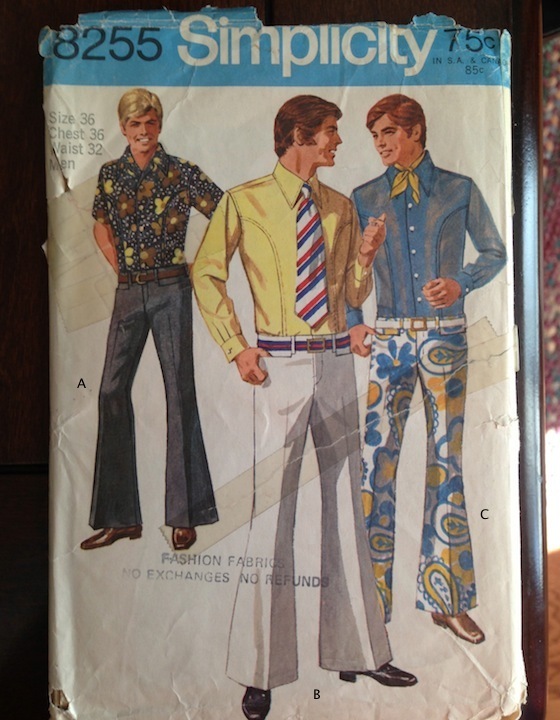 That ascot, those pants, that white belt...doesn't it scream "Business Casual"? I think that photo is of Ben, the lesser-stylish twin brother of Ken.
" when its time to change, you've got to rearrange who you are, into what you're gonna be....sha na na na na nana nana sha na na na na." Those are some spiffy duds. Slu, You're a stylish man. Which version should the man receive? Hahahahahahah! I STILL haven't used that saying, and it still rocks! Sorry, none of those would look good on Betty. And no, I don't want to get any of these for Christmas/My birthday/Father's Day. There is a reason you can't even find this clothes at the thrift store. What were people thinking? That makes me think, should we get a man version of Betty? Would the neighbors talk? You are absolutely getting a pair of those pants. Arbor Day? Of course men can have it all, but it does depend on what all means to man. Oh my days, bell-bottoms? Now that does bring back memories. 'Simplicity' was quite famous back in the day. I think that platform shoes would work better with those bell-bottoms than the sensible shoes in the photo. Simplicity still rocks for the ladies. I'm really interested in seeing a new line of patterns for men. "Oh, my days. "; I love that! WHAAAAT???? OMG!! BWAHHAHAHA what a great find! I love the guy in the back posing! Love it. Unfortunately, I can remember those days. :) Have a great day. I hope you do. I will love to hear how you get Mark to model them. Rick said a he had a flower print shirt and a couple of pair of pants like those. Unfortunately not the paisley ones or the ascot. I remember I had a cute wrap around/reversible skirt with matching vest and blouse. Found the pattern and there was the matching fabric with the print in your choice of color. I chose yellow by the way. I want to see a pic of that wraparound skirt! I'm making one and it's from 1976. I have about as much of a chance getting Mark to model clothes as I do winning the lottery. Who knows?